Has fashion become unfashionable? Is cynical realism eviscerating beauty? These are the questions posed in many a think piece in the fashion industry recently in response to the largely unfashionable Spring 2018 menswear shows which fetishised normality, transporting it to an extreme realm where it mutates into something touched by the fashion hand. 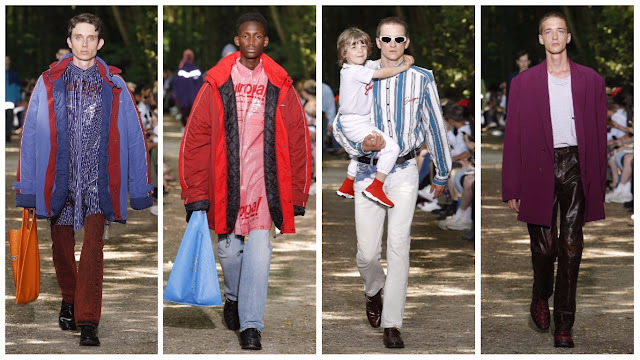 This aesthetic began to emerge a few years ago with the rise of designer collective Vetements—their bitingly sarcastic dissection of consumer culture and capitalistic values electrified the fashion industry when they catapulted onto the scene in 2014, to a healthy serving of critical acclaim. The face behind the anonymous, Margiela-esqe cult is Demna Gvasalia. Not only does he serve his own Swiss-based brand but he’s also artistic director at one of the most storied couture houses, Balenciaga. Balenciaga and Gvasalia have had an interesting relationship in the year and a half they’ve been together. They’ve been embroiled in legal disputes; they were accused of copying a Thai market shopping bag and, more recently, of copying a Ruff Ryders shirt by rapper Swizz Beatz… Gvasalia has made an indelible stamp on the house: there are his incredible, memorable proportion-defying silhouettes, instantly-recognisable handbags and unforgettable imagery from Mark Borthwick, Harley Weir and Johnny Dufort. “Young dads in the park with their kids at the weekend.” If memorability is what Gvaslia is solely striving for he certainly achieves that in his Spring 2018 menswear show, his ode to paternity. 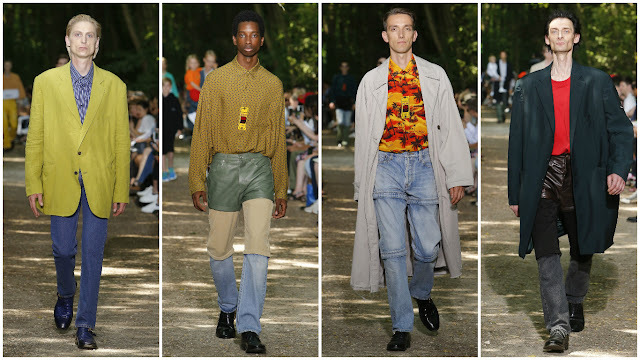 Situated in the Bois de Boulogne, the second-largest park in Paris, the show was characterised by a further fetishisation of normality—specifically, it was told through the narrative of dad culture, society’s new cultural phenomenon that is fascinated with nostalgia and ideas of parenthood. It was 90s-tinged with leather trousers, wide-leg jeans, vaguely hideous Hawaiian shirts and psychedelic outerwear. In the advent of gorpcore and normcore, the eventual dissection of dads was to be expected. This is just another facet to Gvasalia’s exploration of mature men—the ones who have long been forgotten by the fashion industry… but for good reason: they’re everywhere—devoting fashion collections to them is no use. Is this tongue-in-cheek portrayal too fond of its subject? In some ways, no: the exaggerated shoulders, the looseness or tightness of his garments add artistically monstrous qualities to the models—just the kind of sardonicism we’ve come to expect from Gvasalia and his frequent collaborator, the stylist Lotta Volkova. The casualness of this collection too had its perversities. Shirts and hoodies were sheathed in plastic, a characteristically fetishistic addition. Perhaps the most important part of the unfashionable fashion, cynical realism debates is whether or not the disembowelment of beauty is acceptable. Isn’t fashion meant to be for dreamers, with heightened and unexpected perceptions of what constitutes beauty? Doesn’t this latest trend defeat the purpose of fashion? Demna Gvasalia certainly thinks it’s acceptable, but even he has his moments.